Even though I’m mostly working freelance now and don’t need to wear much more than a T-shirt and jeans on any given day, I still love to dress more traditionally professionally. 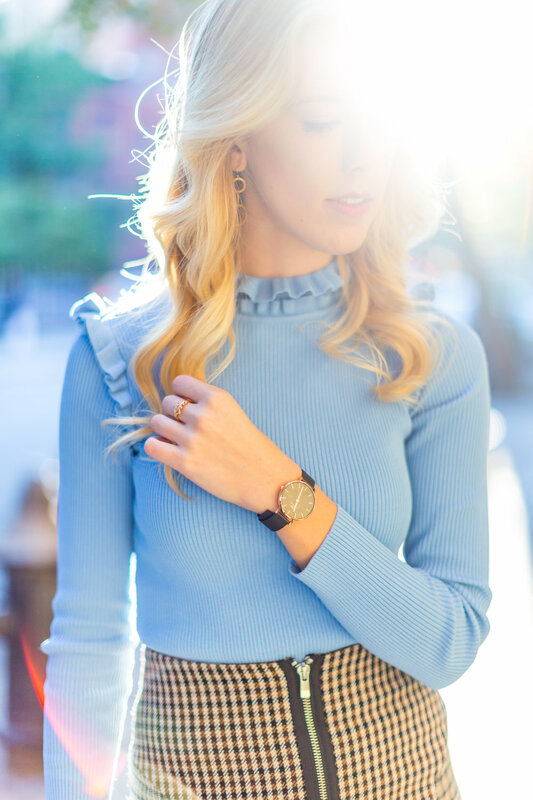 I’ve worked in various jobs for years and even still own a few full suits from my Model UN debate team days in high school and I love the classic vibes of a chic pencil skirt, nice top, and heels. I’ve also always loved to bend the rules of Western business attire and bring in more colors, like burgundy and light blue, that only compliment the boring blacks and grays so typical of office life. The fashion world has witnessed an interesting shift in the past decade that has moved away from the drab workwear of our parents’ generation and into a fun crossover of what it means to wear to work. Workwear can be fun, too, and doesn't just have to be worn to work. In fact the fall trend of incorporating seemingly masculine suiting pieces and patterns into feminine ensembles is the perfect space to explore this fun juxtaposition. Thanks Marko for the photos!